Android phones are produced at a larger scale and they are dominant in the phone market. The popularity of android phones have also made easy for fake phone dealers to flood the market with fake android devices making it hard for people to identify a fake android phone from an original one. We have for you 10 (ten) tips that you can take note of when making comparisons to android phones before purchasing one. Do not ignore the looks of the screen as it is always the first means of recognizing and identifying a phone. Original phones have a bright and neat screen. If the screen is dull, you can be up by 70 percent sure that you are about - getting a fake android phone. Another thing to look out for is the logo. Once you turn on the phone and you realize that the logo is blurry and not smooth, something may just be wrong. Take a look at the gap between the end of your display screen and the edge of the phone. If the dark gap is wide, you are about to buy a fake phone. Placement of cameras and buttons or even logos sometimes lets you know that the phone is not original. There is consistency in the way all these are placed in any original Android phone. After turning off the phone, hold the power on + home + volume up keys at the same time for a few seconds. If it is an original Android phone, the recovery menu will appear. However, if it is not, you may not see the typical recovery menu option. Another great way of knowing a fake Android phone is when you consider the camera. While most original phones come with very sharp and good cameras, pictures taken with fake Android phones are most times blurry. The screen is very important. Not the display this time, but the screen texture. Original Android phones should come with a screen’s glass material. If you run your finger through it and it feels like plastic more than glass, then the device is made of cheap glass material. Essentially, it cannot be original. You can go to the setting of your phone and attempt a factory reset. If it doesn’t work, you are with a fake phone. If it does and returns normally congrats, your phone may be original. If it doesn’t come back normal, things are bad and you may be using a fake one. Check the manual of the phone and see what specifications it has, then go through the phone to see and see if that is right. Secondly, check the phone’s website to see if it is the same specifications that the original phone has. Don’t ignore the fact that fake looks fake. 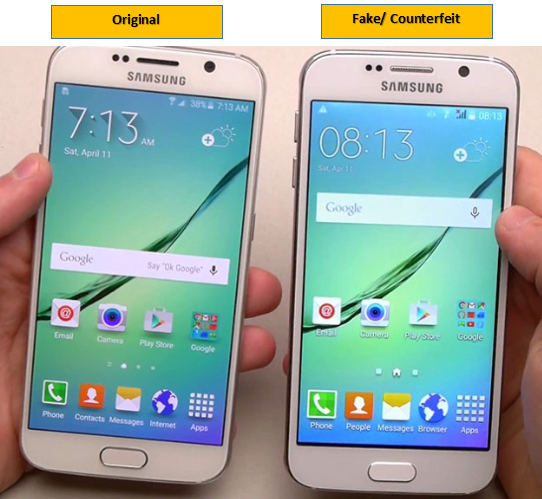 If the phone looks very cheap and rushed, you are more than likely with a fake phone. If it is too cheap and is even cheaper than it sells in other places, avoid it. It is most likely a fake one. By their prices, we can easily tell. Buy from authorized Digicel Dealers and trusted sources only. Most of us prefer the convenience of picking phones from any available shop, but the problem is that it only increases our chances of getting fake phones. Ensure that you get a warranty certificate of at least 1 or 2 months. It will keep you covered if something happens. If it is not an original android phone it is most likely that it will not be granted a warranty certificate.